Cost sharing has become commonplace as businesses look to shave costs without giving up a strategic edge. Big dollar infrastructures are good examples of where companies are willing to work together to defray the costs for all. For instance, wireless service providers no longer build their own cell towers; they share towers to avoid redundant sites and reduce capital expenses. These towers are typically owned by a separate tower operator who leases capacity to competing carriers. Here, the infrastructure itself does not provide the leverage, it's all about what you do with it that matters. So why not apply that same cost sharing strategy to product distribution costs? The strategy would be powered by neutral third parties whose only job is to move goods efficiently from factory to retail shelf. It makes total sense when you realize that tens of thousands of manufacturers are shipping goods to a relative handful of retailers. Think about the kind of waste created from all these parallel lines of supply. Too many trucks deliverying too little freight to the exact same retail customers. That's like having several ugly cell towers, operated by separate carriers, sitting back to back to back on the top of a hill. But the folly of the redundant cell towers is visible for all to see. Epic waste and silo thinking staring us right in the face. Not so with product distribution, where freight moves invisibly down the highway as costly LTL loads because smaller shippers lack the volume to ship in full truckloads. In a collaborative distribution environment, consumer product manufacturers would consciously co-locate inventory in multi-client warehouses run by neutral 3PLs that house like products shipping to the same retailers. 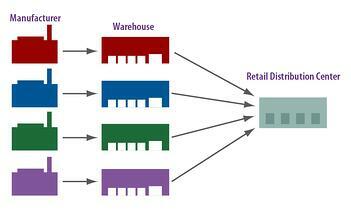 To capitalize on these collaborative distribution campuses, retailers would change their purchasing processes. Instead of letting buyers order separately from hundreds of different suppliers, the retailer would instruct buyers to create consolidated orders for suppliers whose inventory is located at the same DC. The 3PL would process orders and ship them out as a single TL shipment, equitably parsing out transportation costs based on the percent of the consolidated load each supplier’s product represents. This is already happening on a small scale. As an industry, we need to make it the norm. 3PLs win by establishing another level of added value, namely, an ability to bring together like shippers for shared savings. Collaboration with retailers and other shippers can be difficult and time-consuming. But you can take a step forward by asking one simple question: "Can I distribute my products from a 3PL location that houses products similar to mine and are shipping to the same retail customers?"